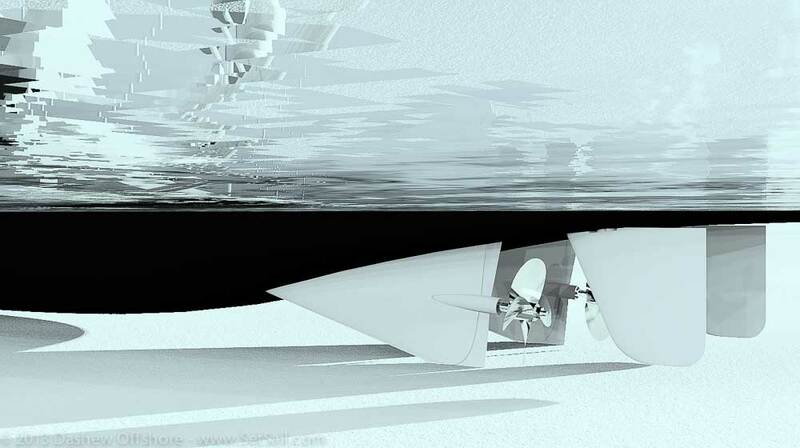 Skeg, rudder and canoe body integration play a large part in comfort on passage, heavy weather tactics, maneuvering in port, propulsion efficiency, and tolerance for operator error. The absolute number one priority should be control in heavy weather, followed by maneuverability in port (this without resorting to thrusters). Then comes tolerance for operator error and bad luck. 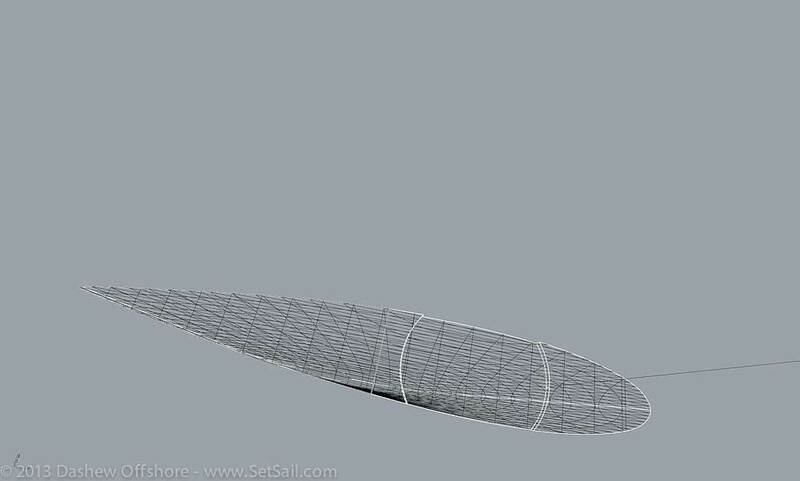 All of the above is directly related to draft, and to the propensity of the fins protruding below the canoe body to interact with nets, floating line, ice, and other forms of debris. Many yachts are fitting with a beam between the keel or skeg and rudder to reduce entanglement risks. However, we avoid this practice, as when the inevitable grounding occurs, deflectors between keel and rudder tend to be bent upward, resulting in a jammed rudder, or worse. We use a combination of skeg leading edge angle, and rudder toe round to shed debris. Having rolled many logs under the hull of Wind Horse, pushed through ice, and spent several cruising seasons co-habitating with millions of lobster pots, we can attest to the fact that the system does work. Although we want the skeg and rudder to have as small a cross section as practical to reduce interference with water flow to the prop, these have to be strong enough to take abuse. And then hopefully – no guarantees here – be so constructed so that the foil bottom deforms and unloads before damaging the rudder shaft or skeg structure above the tip crumble zone. Over the years, there has been a fair amount of real world testing of these principles, and so far we are doing OK. 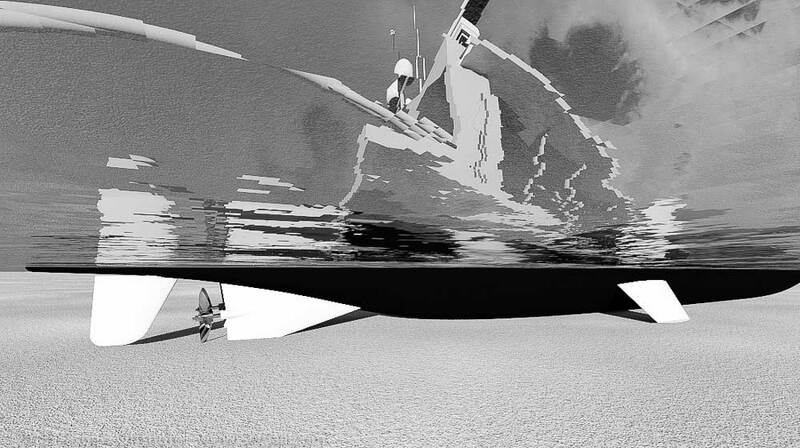 The rudder shape is a derivative of a foil we developed in the 1980s for our Sundeer designs. It has excellent drag characteristics, and a cross section that allows an over-sized rudder shaft, without making the rudder foil too fat. All of the preceding has a major impact on prop efficiency. Even the rudder, which is behind the prop, affects what is happening upstream; hence our somewhat obsessive attitude toward these details. A final comment on drying out on a tidal river or beach. There are several schools of thought on how to design fins for this process. The approach we are using with the FPB 78 is one example. The canoe body has a grounding flat down the centerline for drying out. The intention is for this to help support the hull. 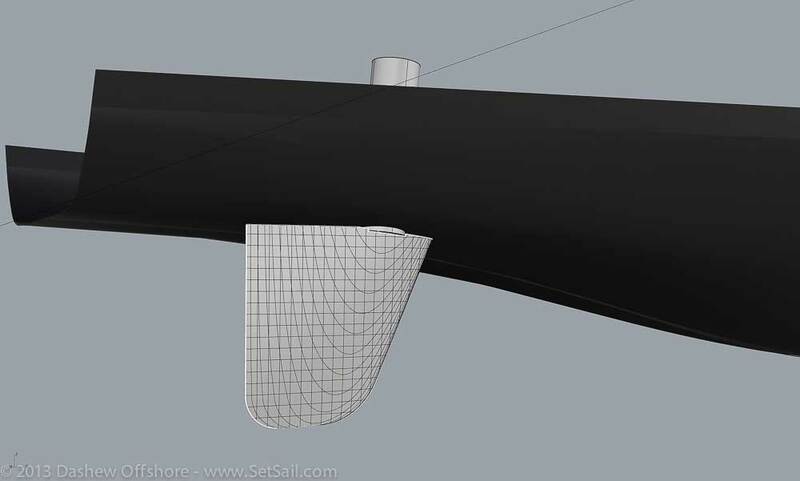 The center of gravity is well forward of the aft end of the flat, so assuming a firm bottom support of the hull, there is little tendency for the hull to rock aft. Where the bottom slope is even, the skegs will dip below the surface as shown above. The rudder would normally be just above the surface. There is a synergism between the thin foils we want for efficiency and the bottom as shown here. The thinner the foil, the more easily it penetrates the bottom and unloads itself. This entry was posted on Friday, November 15th, 2013 at 5:38 am and is filed under Dashew Logs, FPB 78, three. Both comments and pings are currently closed. We’ve been tempted to try drying out here in the Pacific NW, but, with rather mucky, sticky mud sea bottoms (at least where we avoid rocky bottoms), we fear our foils might sink into the seabed as the tide ebbed, leaving us literally stuck in the mud as the tide flooded. I’m certain the SARAH-SARAH would “pop out” but only with enough incoming tide to provide sufficient buoyancy. The fear being the tide height when we entered the location might have to be a good deal higher to release her. Your thoughts? There are lots of variables involved in the gridding process. To begin with, it is important to avoid drying out or gridding on a spring (highest) tide or it might not be until another spring tide that you have sufficient water depth to float off. That said, leaving aside the issue of rocks in the wrong place at the wrong time. I would not be overly comcerned with the risks associated with the stabilize fins being caught in the mud. These fins are nine suare feet – less and a meter square – and they cannot generate a great deal force from the mud. Of course nothing to do with boats (or life) is without risks. In this case, probles are most likely to manifest themselves in the form of a damage stabiler fin. Since the fin mechanisms are located in coffer dams in the unikely eent of a leak, it will be contained. Sounded to me as though Bill was concerned that there might be sufficient suction from the mud on the hull that it might “hold the hull under water” beyond the normal waterline. He acknowledges the probability of sufficient buoyancy to eventually “pop out” but that it might require more lift than there was tide. First, I sure would love to watch:). But I expect if you dried out from a 3/4 tide, there would be more than enough tide to re-float. I bet Steve would know how much lift each inch of “vertical” water line created. I bet even in a muddy bottom the suction would be minimal on the hull. Might mess with your bow thruster though..
Take pictures if you ever brave the experiment, I am sure everyone would love to see them. The FPB 64 has roghly 3400 pounds of bouyancy per inch of immersion at half load. And this value goes up the more the hull is immersed due to the flare in the topsides. We very much look forward to the photos! In your newer designs it seems that you have eliminated the propeller protecting metal bar protruding from the skeg. Why is that so? Do you thing that it makes sense to use a similar appendage on a sailboat?